"There's been so much spin and propaganda and rumours and politics. So many 'experts' give their opinions. All we want are basic facts." Evert Van Zijtveld, deputy chairman of the MH17 Air Disaster Association, lost his son, daughter and parents-in-law on flight MH17. The Malaysia Airlines Boeing 777 was shot down on 17 July 2014 at the height of the conflict between pro-Russian rebel forces and the Ukrainian army. Access to the wreckage was limited. The catastrophe was swiftly hijacked and politicised. Fifteen months later, the Dutch Safety Board is finally publishing its definitive report. The aviation report will not apportion blame: its sole purpose is to establish what caused the crash and "prevent similar incidents from happening again". The issue of criminal liability is being dealt with by a separate criminal investigation, led by the Dutch prosecutor. The key theory is that the plane was shot down with a surface-to-air BUK missile. Air traffic restrictions had been in force over eastern Ukraine after 1 July 2014 because of the hostilities. On 17 July, the minimum altitude was 32,000ft (9,754m). MH17 was flying 1,000ft (305m) above that. There were three other passenger jets flying over the same restricted airspace around the same time. The disaster raised the question: should civilian aircraft have been banned at all altitudes given the presence of such powerful weaponry? The BBC has learned that the relatives are partly driving the scope of this investigation. "The next of kin asked us to look into the question of whether their loved ones knew what was happening," Wim van der Weegen from the Dutch Safety Board told the BBC. "We promised to look into it and try to provide them with an answer." In the days after Germanwings Flight 4U 9525 went down in the French Alps in March 2015, the French prosecutor shared chilling details about the final eight minutes on board. The cockpit voice recorder captured the sound of the pilot frantically trying to break down the cockpit door, the rising sense of panic on board and the passengers' screams. Until now, the final moments on board MH17 remain a mystery. The DSB's preliminary report, published in September 2014, revealed that MH17 made no distress signal - raising the possibility that those on board lost consciousness so quickly they would not have suffered the same terror. The flight data recorder and digital cockpit voice recorder both stopped at 13:20:20 GMT. Dutch former Foreign Minister Frans Timmermans' suggestion that some of the passengers were wearing oxygen masks infuriated some of the relatives and alluded to their worst fears - that their loved ones may have been aware that the plane had been hit. At the time, a spokesman from the Dutch prosecutor's office told the BBC it was too soon to tell whether or for how long the passengers on flight MH17 were conscious. This is the most delicate question to be addressed in the report. According to Katrina Taee, a bereavement counsellor, the answer will either offer reassurance or dredge up the relatives' deepest fears. "If the report finds that they knew they were going to die, that death wasn't immediate because only part of the plane was hit, the pain will all be dredged up again. "It could be a terrible trigger for them, to reignite the pain," she says. "If you've really loved someone it's critical to witness the transition between life and death and to know the end of their story. At 13:20 GMT on 17 July 2014 Hans de Borst was in his office. Just before takeoff, he had sent his 17-year-old daughter Elsemiek a text: "Have a good flight. Maybe you can watch a movie! Bye darling." He never received a reply. At the same time, Silene Fredriksz was dancing at a work barbecue. "I used to love music...". Her eyes glaze over; she turns away. Her son Bryce and his girlfriend Daisy had earlier tossed the covers off their bed, grabbed their rucksacks and dashed out of their neat, terraced house in Rotterdam. The young couple's bedroom has been left untouched since the day they departed. Across the North Sea Barry Sweeney was attending a funeral in Newcastle. He gives a wry smile, acknowledging the agonising coincidence. At 13:20 GMT the passenger jet carrying Elsemiek de Borst, Bryce Fredriksz, Daisy Oehlers and Liam Sweeney and 294 others was shot out of the sky. "I can picture Elsemiek. She would have had her headphones on, her knees propped up against the back of the chair and she'd be engrossed in a movie... probably Game of Thrones or Lord of the Rings. "And to be honest, even if they did know," Elsemiek's father Hans says, shaking his head, "I don't want to know." "They definitely wouldn't have felt anything," Robby Oehlers, Daisy's uncle assures me. "It would be so cold up there, the oxygen would disappear, they'd take one breath and that would be it." "Liam and John [Alder] would've been drinking pints of Newcastle Brown at the airport, they'd probably still be drinking or passed out drunk when the plane was hit," says Liam's dad Barry Sweeney. "They wouldn't have felt a thing." 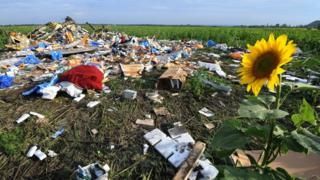 The MH17 disaster happened in the digital age. Countless images were shared, spun, rejected and, possibly, altered, at unprecedented speed on social media. While the criminal investigators sift through more than 5.4 billion pieces of potential evidence, a new breed of online detectives have been producing their own interpretations. One of the most high profile is Elliot Higgins, who runs the Bellingcat website, which recently published its own investigation. "What we have with MH17 is that there is a vast amount of information available to anyone - photographs, videos or even social media posts, that relate to what happened. "The official reports haven't produced much information so there's a lot of room for speculation. "What does surprise me is how poorly governments have adapted. What you're going to find is that there some information in the [Dutch Safety Board] report but there is going to be this frustration because the whole story isn't there, when there's so much information available online. "I think governments should start using open source investigations so people have more faith in what they're doing." The Dutch Safety Board might not provide a conclusive answer as to whether the crew and passengers were conscious in those final moments. "Now finally we're getting answers from an organisation that can verify what actually happened," says Evert Van Zijtveld. "But we still need proof. If they say our families felt something, we want evidence."